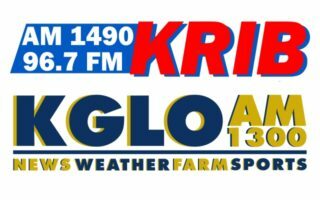 CEDAR FALLS — A reminder coming up this week you can hear live & local coverage of Rockford and West Hancock state semifinal football on AM-1300 KGLO, kgloam.com, and via the KGLO mobile app. You’ll hear the Rockford vs. Southeast Warren 8-man semifinal game on Thursday starting at about 8:40 AM, with the West Hancock-Hudson Class A semifinal on Friday at about 9:40 AM. AMES — Iowa State coach Matt Campbell does not want to discuss the Cyclones’ chances to qualify for the Big 12 Championship game. A four game win streak has put the Cyclones in the thick of the chase and they hope to stay there this week when they host Baylor. Campbell says the best approach is to focus only on this game. Baylor coach Matt Rhule says the Bears need to find a way to solve Iowa State’s defense when the teams collide in Ames. Baylor is 5-4 after beating Oklahoma State and take on an ISU team that has won four in a row. Rhule says the Cyclones are more multiple on defense than they were last season. Rhule says the Bears will need to match the Cyclones from a physical standpoint. 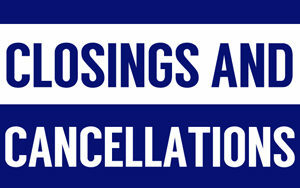 Kickoff on Saturday is scheduled for 2:30. AMES — Iowa State opens the new basketball season Tuesday night by hosting Alabama State. Injuries will leave the Cyclones thin in the front court and coach Steve Prohm is hoping to see progress on defense. On offense Prohm wants to see improvement with ball movement and spacing. Tipoff at Hilton Coliseum is scheduled for 7 o’clock tonight. IOWA CITY — Spencer Lee is only a sophomore but coach Tom Brands says he has already become an ambassador for the University of Iowa wrestling program. Lee lived up to expectations a year ago by winning an NCAA title as a freshman and will be heavily favored to duplicate that feat at 125 pounds. The Hawkeyes open the season ranked third and the team to beat remains top ranked and defending national champion Penn State. Brands says several newcomers will be counted on to boost their depth. The Hawkeyes travel to Kent State this weekend and open with a dual against Cal State-Bakersfield on Friday. MASON CITY – NIACC sophomore outside hitter Hannah Wagner has been selected to the Region XI first team. Wagner, who led the Lady Trojans with 581 kills, is the first NIACC player to earn first-team all-region honors since Samantha Pedersen was a first-team pick in 2009. The 581 kills by Wagner this season ranks first on the school’s single-season kills list. Also, NIACC freshman Kennedy Meister was a second-team all-region selection as an outside hitter. Meister was second on the team with 408 kills, which ranks fourth on the school’s all-time single-season list. NIACC sophomore libero Connor Gauch and sophomore setter Sydney Roush were both honorable mention all-region picks. Gauch led the Lady Trojans with 651 digs, which ranks first on the school’s all-time single-season list, and Roush led the team with 722 assists, which ranks 12th on the school’s all-time single-season list. 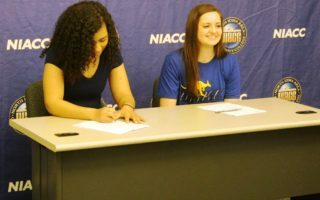 Gauch ranks fifth on NIACC’s career digs list with 813 and Roush ranks third on the school’s career assist list with 1,521. Wagner, who is NIACC’s career kills leader with 859, was also a first-team Region XI-B selection. Meister and Gauch were both second-team Region XI-B picks. Region XI-B, this season, was made up of teams from Northeast, NIACC, Hawkeye Community College and Southwestern. NIACC was 23-15 in 2018 and advanced to the Region XI-B title game before falling to Northeast Community College.